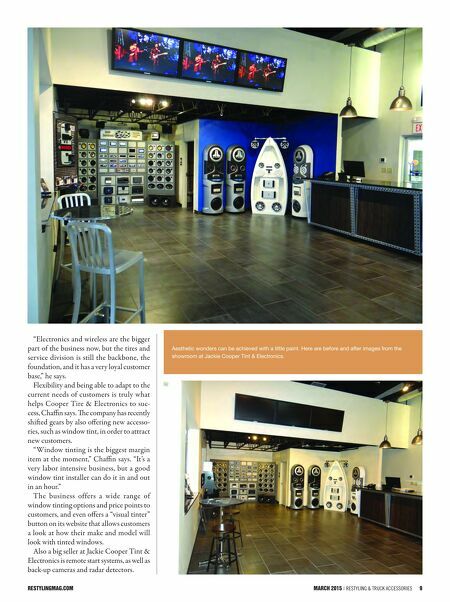 restylingmag.com March 2015 | Restyling & tRuck AccessoRies 9 "Electronics and wireless are the bigger part of the business now, but the tires and service division is still the backbone, the foundation, and it has a very loyal customer base," he says. 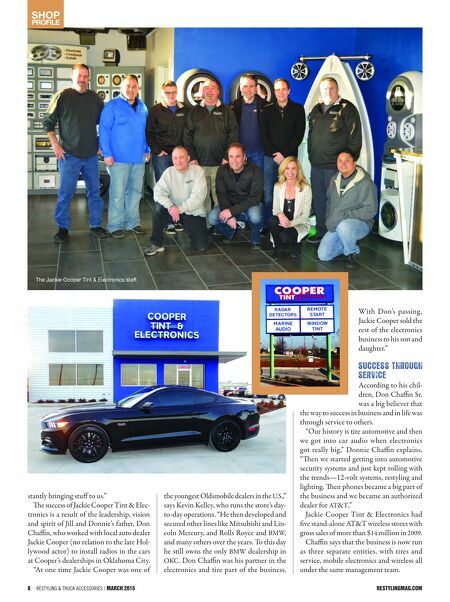 Flexibility and being able to adapt to the current needs of customers is truly what helps Cooper Tire & Electronics to suc- cess, Chaffin says. e company has recently shied gears by also offering new accesso- ries, such as window tint, in order to attract new customers. "Window tinting is the biggest margin item at the moment," Chaffin says. "It's a very labor intensive business, but a good window tint installer can do it in and out in an hour." The business offers a wide range of window tinting options and price points to customers, and even offers a "visual tinter" button on its website that allows customers a look at how their make and model will look with tinted windows. Also a big seller at Jackie Cooper Tint & Electronics is remote start systems, as well as back-up cameras and radar detectors. Aesthetic wonders can be achieved with a little paint. Here are before and after images from the showroom at Jackie Cooper Tint & Electronics.